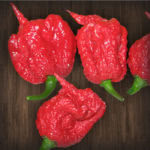 The Cascabel chile pepper (little bell), is also known as the rattle chile. The rattle and bell designations describe the tendency of loose seeds to rattle inside a dried cascabel when shaken. Fresh Cascabel are also known as bola chile or chile bola (Spanish: ball chile). The color of the fresh fruits starts out green and matures to red. 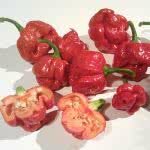 These 3 cm chiles resemble small cherries. Most commonly used dried, the color darkens considerably and are called Guajones’ or ‘Coras’ once dried.